We have carved a niche in the market as one of the trusted Carrot Seed Essential Oil Manufacturers in India. 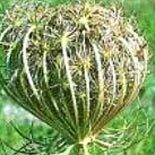 Carrot Seed Oil is extracted from the seeds of Daucus carota. The oil is available in pale yellow color liquid. Carrot Seed Oil is soluble in alcohols and other essential oils but insoluble in water. This oil helps in the condition of dry and mature skin, jaundice, hepatitis, toxic liver and so on.